You are here: Home / Age Discrimination / The Secret to Filing Administrative Complaints with the EEOC or the SDHR: Don’t Do It! Q: Should I file a complaint with the State Division of Human Rights or the EEOC? A: Good question, and I’m glad you asked before you filed, because the answer is, don’t file at either agency, unless you’ve already retained an attorney, and the filing is tactical or strategic. If you feel you are being or you have been discriminated against in the workplace, consult an attorney—most employee rights lawyers will speak with you free of charge—and if they feel you have a provable employment discrimination claim, most will take your case on a contingency basis, meaning the legal fees will be paid only if and when there’s a financial settlement. So, if you have a discrimination claim to assert, get a lawyer to assert it for you. If, at some point, your attorney believes that filing with an administrative agency such as the EEOC or the SDHR will provide helpful settlement leverage, then he or she will draft and file the complaint of discrimination as part of your overall game plan to hold the offending company accountable. The goal should be to settle the case, as trials are actually very rare. The overwhelming majority of cases settle, or they are eventually dismissed by the court. First ask, Why are you filing this charge or complaint with the agency? If you’re considering filing a complaint with the NY State Division of Human Rights or the US Equal Employment Opportunity Commission (or the NYC Commission on Human Rights), ask yourself what you’re trying to accomplish. If you’re seeking some measure of “justice” from your filing, you’re barking up the wrong tree, as it ain’t gonna happen in real life, even if you saw a case similar to yours on an episode of Boston Legal and it all worked out just fine on TV. What’s the potential outcome of filing a charge with the EEOC? Typically, the EEOC finds “reasonable cause” to believe that the employee, or the “Charging Party” in EEOC-speak, was discriminated against at work in only 3.5% of cases filed, and the EEOC prosecutes less than .1% of the cases where reasonable cause is found! And even if you’re lucky enough to win the EEOC lottery and get a “cause” determination, all that happens is a “conciliation” invitation from the EEOC where the employer is invited to attend and participate in settlement discussions with you, but it’s a completely voluntary process. If the employer says fugetaboutit, we’re not coming to the conciliation, then the EEOC’s response is to issue a “Notice of Right to Sue,” which is your permission slip to sue your employer in federal court, but you’ll need an attorney to pull that off successfully anyway, so you’d do much better to have a lawyer fighting for your rights from the very beginning. 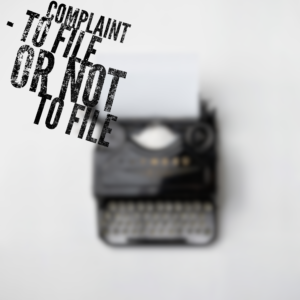 What’s the potential outcome of filing a complaint with the State Division? It’s even more bleak for employees who choose to file a complaint with the NY State Division of Human Rights, as the “probable cause” rate in favor of Complainants is also in the low single digits. But unlike the EEOC, where a determination in the employer’s favor at least results in the possibility of suing the employer in federal court, a dismissal at the State Division forever prevents you from bringing a private lawsuit in state court under the NYS Human Rights Law. So filing with the State Division makes little sense in most circumstances, and it almost never makes sense to file pro se, or, on your own without a lawyer representing you before you file. Tuckner Sipser is an employee rights law firm with offices in Manhattan and Poughkeepsie, NY. They can be reached for a free consultation by contacting Jack Tuckner or Deborah O’Rell.